From preschool to second grade, Time4Learning teaches spelling as a component of the language arts and phonics program. From third grade through high school, spelling is integrated into vocabulary development exercises within language arts and other subjects. Time4Learning helps to teach spelling by starting with the basics of hearing and recognizing the sounds (phonological and phonemic awareness) and then teaches the letters and sounds. Skills are built through spelling games and activities that teach blending, segmenting, word analysis, and fluency. The goal is for students to gain mastery of spelling and reading decoding skills simultaneously. Spelling lists of the “sight words” are taught through memorization techniques. Phonics is taught with word lists that rely on specific letter combinations. These lists of spelling words are used both to recognize sounds for reading and to practice them on spelling tests or in writing practice. Practice exercises includes breaking words down by syllables, blends, and phonemes to help build spelling skills. Phonemic Awareness is the ability to understand the relationship between sounds (phonemes) and symbols (letters). This is done through a progression of skills that lead to improved spelling, reading, and writing. Children begin to gain phonemic awareness through listening and imitating what they hear as infants and toddlers. Rhyming and syllable counting are spelling strategies often used for beginning readers to help them understand similar sounds and to differentiate the phonemes in words. Time4Learning provides students with phonetically organized chapters that focus on one sound/spelling skill so that students can explore one sound or blend at a time for mastery. 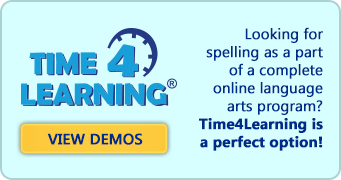 Time4Learning’s language arts program combines decoding strategies with reading comprehension activities, reading fluency practice, and vocabulary, creating a relationship of skills leading to phonemic and phonological awareness. In addition to preparation for the weekly spelling test or spelling bee, parents should help children master their spelling foundation skills and understand the patterns that establish the construction and spelling of the English language. 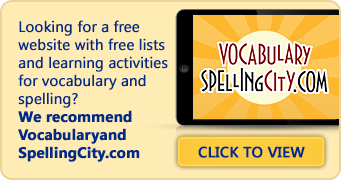 Weekly spelling quizzes and tests for beginning readers and elementary school students help assess learned spelling conventions. Each week should focus on one convention or phonics-based spelling rule at a time to help students gain mastery. Practicing a weekly rule along with a corresponding list of 5-20 words allows students to grasp the concept before moving onward and leads to better reading fluency, spelling, and writing skills. Lower elementary students should focus on sounds and spelling through the patterning of consonant-vowel-consonant rhymes and short vowel sounds for phonemic awareness ( ie: hat, bat, fat, cat, sat). Also, beginning readers should be exposed to high frequency words and sight words. See more spelling definitions in our Spelling Glossary. In Kindergarten language arts, Pig teaches phonemic awareness in the phonics lesson "Exploring the Sound of M."
In this lesson, students are asked to choose the picture that starts with the "m" sound. 1st and 2nd graders may focus on increasingly difficult phonetic spellings such as the Vowel-Consonant-E rule, consonant blends,vowel digraphs, vowel diphthongs and r-controlled vowels for better decoding and syllable segmentation. Being able to decode words and recognize a pattern of rules provides a foundation for beginning readers to gain more accurate fluency, spelling, and reading techniques. Upper elementary students may concentrate on one spelling convention each week such as; when to double the final consonant before adding /ed/ or /ing/ (ie: Swim to swimming) or when to add an /s/ or /es/ to make a plural with continual review of blends, digraphs, diphthongs, homophones, homographs, homonyms and affixes. Focusing on segmenting syllables and decoding words by the root, helps students carry spelling skills over to reading fluency. Homonyms: Words that have the same spelling and pronunciation, but varying meanings (spruce as in to clean or spruce as in a type of tree). Homophones: Words that sound the same but are spelled differently and have different meanings (here and hear, see and sea). It's amazing how quickly my kids are learning difficult concepts on the Time4Learning curriculum. The animation really helps them apply the lessons to something tangible! As part of fourth grade language arts, students are asked to identify the suffix of a word. Middle school students should focus on more advanced conventions such as commonly misspelled words and subject-specific terminology (typology) , along with review of basic spelling conventions. Middle school and high school students may explore more complexities of spelling and vocabulary through studying the etymology of words. Etymology: The history of language through the study of word origins and derivatives. In seventh grade language arts, students focus largely on developing vocabulary and reading comprehension skills. In this lesson, students learn how to identify the meaning of an unfamiliar word based on its Latin and Greek root. Spelling skills should develop as part of an overall language arts program focusing on, phonics, reading comprehension, vocabulary, reading fluency, grammar, reading and writing program. Skilled, fluent readers are the culmination of the successful learning of a broad array of pre-reading and reading skills. Irrespective of family background, learning to be a skilled speller is often not a trouble-free process. Spelling programs, personalized tutoring, reading workbooks, spelling games, and structured computer spelling programs can help teach or reinforce these skills. Some children need spelling practice, while others need more intensive remedial spelling programs. Parents can help their children with the spelling process by providing high-quality educational materials, establishing a pattern of daily spelling and reading, instructing through guided spelling activities, creating a rich language environment, discussing a child’s progress with teachers, and following up on their recommendations. Time4Learning offers fun, computer spelling and reading programs, which help reinforce spelling skills at home through educational activities and learning games. Learn more about Time4Learning’s computer reading programs, for PreK through 8th grade students.